This year, the teachers and administrators in our high school decided to participate in a big read. The Big Read was originally a program sponsored by the National Endowment for the Arts to promote literacy in a community. The idea behind a big read is for people from diverse backgrounds to come together and discuss a text. Our high school decided to try a modified version of this with teachers and administrators. So, today, over 150 people came together to begin reading our selected book and discuss teaching strategies. Our book this year is Make It Stick: The Science of Successful Learning by Peter C. Brown, Henry L. Roediger III, and Mark A. McDaniel. Make It Stick is a book about how we learn and the many strategies that can be implemented to help people become more productive learners. In my opinion, it is essential reading for anyone in education interested in improving how they organize lessons for students and how they assess student understanding. How do schools get learning wrong? How do schools get learning right? Why do the authors say, “learning is an acquired skill, and the most effective strategies are often counterintuitive”? How does the myth of repetitive practice influence our teaching? Do you agree with Einstein that “creativity is more important than knowledge”? What is the power of active retrieval? How can what you learned in chapter one influence your teaching this week? Like the humanities department, the STEM department also focused their discussions on finding specific strategies from the reading that can be implemented in classrooms and sharing those strategies with their groups. For many of us, our big takeaway from chapter one was understanding that learning can be difficult, and in many respects should be difficult–with students being allowed to learn from mistakes. Letting students grapple with difficult concepts prior to instruction can lead to lasting benefits in terms of how material is remembered. Not to spoil things for our big read community, but I’ve become fascinated with the research of the Harvard psychologist B. F. Skinner who becomes a minor figure later in the book. In my opinion, his concept of “errorless learning“–the idea that errors are not necessary for learning to occur–has exerted a great influence in the field of education as many teachers (myself included) can sometime shy away from allowing students to make mistakes and then learn from them. After reading chapter one, many people I talked with felt that adjusting their instruction to bring more problem solving to their classrooms might benefit students as it will encourage them to take chances as they solve problems and learn from the mistakes they might make in the process. I have already received e-mails from teachers who are beginning to tweak their lessons to incorporate a more generative approach to instruction with lessons based on traditional problem- and project-based learning models or by using a SOLE lesson with their classes. Make It Stick has had a profound impact on how I think about teaching and learning. I’m excited that our teachers and administrators will begin using the book throughout the year to serve as a framework for how we discuss instruction and assessment. I’ll update the blog with how we’re using it during the year and the types of questions it raises during discussions. 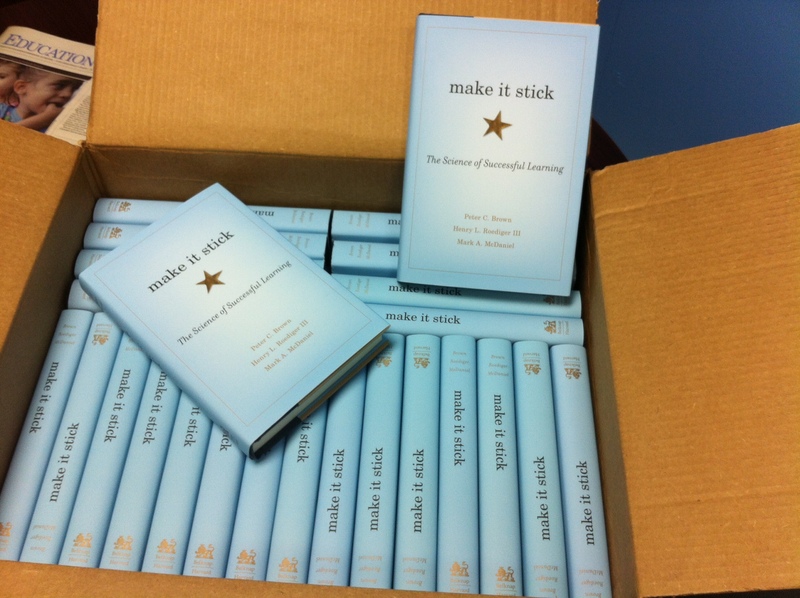 I really think Make It Stick is one of the most important books about learning that has been written in some time.